Would you believe that before I went to Australia I had never before seen a latte in a glass? Some of you may screech of a deprived childhood but I must admit that I don’t think latte glasses or coffee art hit the UK until the last year or two. Usually imported from our antipodean friends, I have only come across latte glasses in the UK when visiting cafes owned and run by Kiwis or Aussies. The norm in their home countries, it would seem the obvious choice to continue the practice once set up over here. However, we British can be a little bit slow on the uptake when it comes to these new fangled coffee trends and I haven’t really seen it implemented across the board yet. The thing I don’t get though is - why not? Lattes, when well poured, have the most elegant layers and what better way to show off their caramel nectar than through a vessel which displays them in their full splendour? Add to that the magic achievable when you add coffee art to the glistening, foamy top and you get yourself more than just a blooming good caffeine hit - you get paradise in a glass. For me, coffee drinking should always be a three dimensional experience- smell, appearance and taste all taking their toll on my overall enjoyment. Coffee in the UK often lacks in all three of these categories and I’ve lost count of the amount of over-enthusiastically frothed cappuccinos I’ve been subjected to. 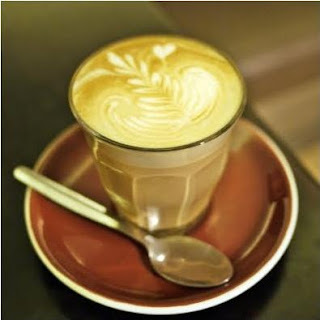 In Australia and New Zealand coffee making and drinking is an art. Cafes call their staff baristas, treating them with a kind of revered respect in full recognition of the skill it takes to turn out coffee after coffee of the same impeccable standard expected by their loyal customers. I can only hope, for all our sakes, that quality coffee crafting is something quickly rolled out across the UK so that we too can come to expect this kind of standard as the norm. In the meantime, if I’ve sparked your interest, take at look at the Barista Brothers’ website - it’s got lots of great videos showing how to ‘free pour’ amazing coffees and believe me, the extreme sports lingo won’t be lost on you for long.